We're set up on the historic square with a special selection of original artwork for bidding. This is our annual fundraiser. Come support your local non-profit art association and take home a wonderful original piece of art. Shanley House Gallery will be open until 8pm as well so stop in and see the Spring Show before if closes. Rebecca Zook, our featured artist for Last Saturday Gallery Night, has already set up her larger pieces in the gallery. More of her work can be seen on Saturday. We will still be on the square accepting your silent bids on a variety of original art starting at 11am. 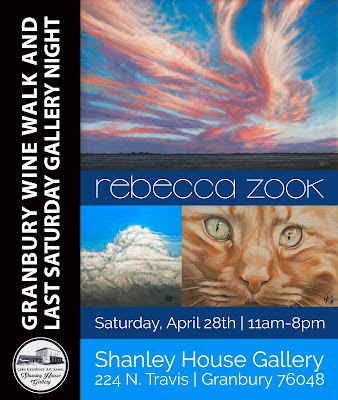 Shanley House Gallery will be open from 11AM through 8PM to include Last Saturday Gallery Night. Granbury artist, Rebecca Zook, will be featured along with the Spring Show. Stop in and see her amazing cloudscapes, landscapes and more.